Over the years you’ve likely made some changes to your home. Creating your dream home is an ongoing process, after all. So what happens when it comes time to move on to a new dream home? The updates you made could end up making or breaking a sale. 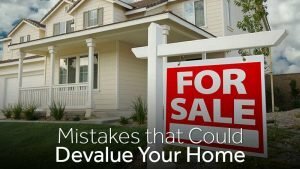 To avoid finding yourself in the latter situation, here are four mistakes homeowners commonly make that devalue their home. Taking care of your property on a regular basis is one of the most effective ways to maintain its value or even improve it. When you don’t perform maintenance on your HVAC system, lawn, roof or other parts of your house and yard, the value of your home will surely decrease over the years. Regular maintenance helps boost your home’s curb appeal and decreases the likelihood that you’ll need to complete major repairs before selling. Whether you want to remodel one room or your entire home, it’s crucial to make sure you hire reliable and experienced contractors. 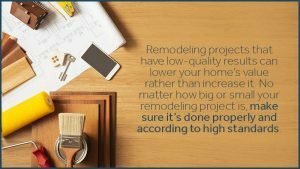 Remodeling projects that have low-quality results can lower your home’s value rather than increase it. No matter how big or small your remodeling project is, make sure it’s done properly and according to high standards. Having an in-ground pool can make your home more appealing to home buyers and increase its value, especially if you live in an area that has mild winters and hot summers. However, having an above-ground pool can have the opposite effect. These pools can be an eyesore and a maintenance issue for some home buyers, causing them to think twice about placing an offer on your home. Having customized features in your home in terms of design, such as a boldly colored accent wall in an unusual color, provide it with some creative flair, but they can also lower its value. Customized features that clash with more traditional or standard ones tend to make it more difficult for you to attract interested buyers when selling your home. Buyers might also be unwilling to pay as much for your home if they know that they’ll have to spend time and money making changes to your customizations. If you already have customized features, consider changing them to more standard ones before putting that “for sale” sign in your yard. When the day comes and you start packing up to move, keep Zippy Shell in mind! We’re offering length-of-stay-promos for 15-foot containers to help you get the most storage for your hard-earned cash. Those booking for just one month qualify for our standard web discount for a total of $159. If you book for three months, you’ll get $40 off the base price, which comes to $149. And if you go all out and book for six months, you get $40 off the base price and 50 percent of content protection (a $10 value).